In 1966 Course Architect David Tucker purchased 60 acres of land in the Charnwood Forest and by 1967 the original 9-hole course was in play. Later that year, ownership passed to Brush Engineering of Loughborough who continued to develop the course over the next 14 years. In 1982 Lingdale Golf Club members purchased the club and in the late 1980's expanded it successfully to 18 holes with the acquisition of additional land. October 1999 saw the start of a major greens renewal programme and within a remarkably short space of time, all 18 greens were reconstructed to the USGA specification. 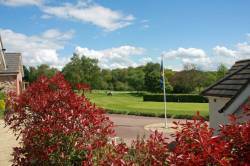 They have now matured into excellent condition and provide year-round play. In the summer of 2006, the new clubhouse and professional shop were opened and both now provide modern facilities for a maturing golf club. Throughout 2017 Lingdale Golf Club celebrated its 50th Anniversary with a number of special Anniversary celebrations. These included a Back In Time event whereby current and past members got to play the golf course in its original nine hole layout. Next up was a special Anniversary Weekend Members competition whereby all members had the opportunity to win £500 off of their 2018 subscriptions. The main event of the year was a 50th Anniversary Gala Dinner which was attended by 176 members and guests, this took place in the clubhouse and a special marquee which was fitted to the side of the clubhouse. The final Anniversary event was a 50th Anniversary Shotgun Open, this proved so popular that an afternoon event was also added in meaning that for the first time in Lingdale history a double shotgun start competition took place. As well as these events the Golf Club also hosted a number of important County and Midlands competition. These included the Midland Golf Union Seniors Autumn meeting, the Midland Queen of Clubs and also the SLRGC four counties competition which a Leicestershire and Rutland team which included a number of Lingdale members won. As well as this a book entitled The Anniversary Book has been written by author and member Phil Fricker and is available at a cost of £14.95. The book makes a fascinating read and if you are interested in purchasing a copy, please contact the Club Manager on 01509 890703.